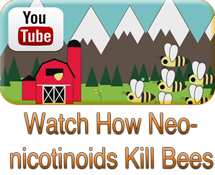 9 December 2016 - Neonicotinoids kill beneficial insects...then more pests...then neonics needed...etc. 25 November 2016 EFSA confirms that the still authorised neonicotinoids intoxicate our bees, Health Canada as well! 20 August 2015 Neonicotinoids linked to bee decline in UK and do not improve yields nor farmers' profit! 20 October 2014 US EPA declares neonics use on soybean useless, despite uses higher than 95%! June 2014 Neonicotinoids residues in food! June 2014 British publication confirms long-term persistence of neonicotinoids in soils! June 2014 Pollination service more valuable than fertilization or irrigation new study shows. 11 June 2013. Neonicotinoid insecticides residues in our food! 5 March 2013. How pesticides industry twist facts and figures to scare European decision-makers on neonicotinoids.